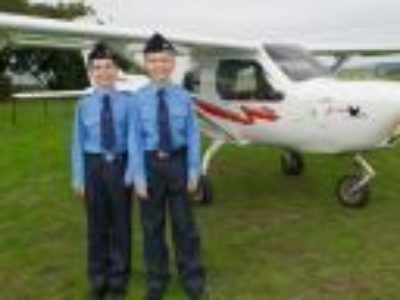 The new “City of Whittlesea” Squadron of the Australian Air League is off to a flying start with the first section of cadets under training. Under their Squadron OC Mr Bryson Shearwood the new cadets have already completed their first two badges, learning the basics of aviation with the GP6 and GP5 badges. They have also had marvellous support from two other local Squadrons with the older NCOs helping with drill and instruction. The Squadron meets at the Lower Plenty Salvation Army complex in Mill Park, the Salvation Army have been extremely helpful to the young Squadron with rent assistance and the cadets will be assisting at the upcoming Red Shield Appeal which should also assist publicising the Squadron to the wider community. Upcoming events include the cadet’s first Flying Day in May, and a flight simulator instruction day in June. Publicity is also in hand with several large shopping centres nearby and some new developing tonwships within the area. Now that the training of the first section of cadets is well underway it is anticipated that the Squadron will grow within the next term as the publicity starts to provide interest with the local youth. Watch this space to hear about new Squadrons opening in the future!